mSATA Hard drive is a solid state drive (SSD) that utilizes mSATA interface to connect to the motherboard. The drive was initially manufactured with a mini interface for notebooks and laptop computers. Previously, mSATA SSDs could be found in 16GB and 32GB models and were used to hold boot files to increase boot performance. They are now available in large capacities, thus the term ‘mini SATA’ has been changed to ‘mSATA’. These drives are available in capacities ranging from 64GB to 2TB and use both SATA and PCI Express interfaces. You can find the widest variety on Memory4less.com. There are multiple types of mSATA SSD Hard Drives such as Single-level Cell (SLC), Multi-Level Cell (MLC), Triple-Level Cell (TLC) and Enterprise MLC (also known as eMLC). MLCs are usually used in consumer-grade PCs while SLCs are used in commercial and industrial PCs. This explains the price parity that exists between these types of mSATA SSD drives. Manufacturers are now focusing on eMLC Internal HDDs that have high endurance and reliability. The real concern is making them available at the price of MLCs. 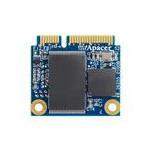 You can buy all types of Micro-SATA SSDs on Memory4less.com. Just choose a drive that suits your needs and order it online.